We heard about the Romantic Road route, through Bavaria, about a year ago and have been desperate to visit ever since, especially after we learned that it hooks up perfectly with a trip to Neuschwantsein Castle – a place we have been obsessed with ever since we saw it in a German text book at school! So, after some research, and discovering that it’s an easy enough route to do using either public transport or hiring your own car, we booked our trip for February! As this was out of the height of tourist season, we hired our own car to give us plenty of flexibility. 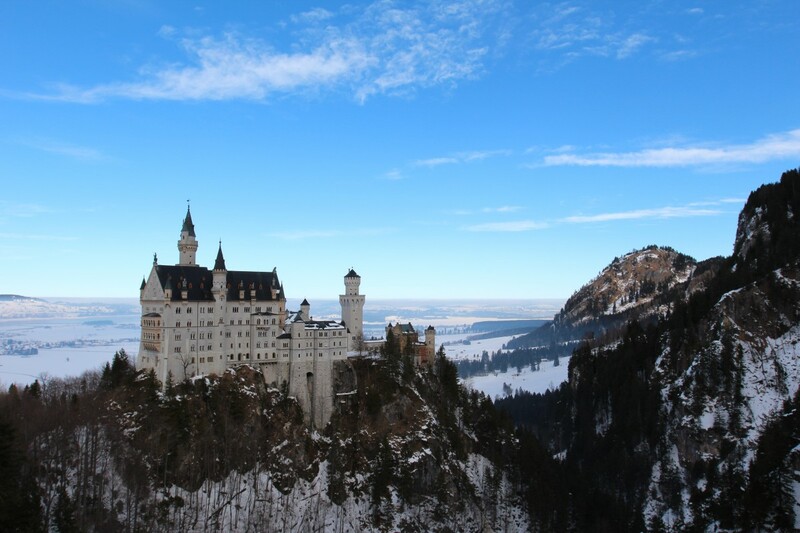 The Romantic Road is a 400km route that runs from Würzburg right down to the Bavarian Alps, straddling Austria and Switzerland. This ‘themed’ route takes in southern Germany’s most picturesque towns, cities and famous castles. It was a route dreamed up in the 1950s after WW11 to increase tourism back to the country and is now a booming tourist route. Although some towns do certainly play up to the ‘kitsch’ theme, there is culture, history and scandal galore along this route and well worth a trip. Deciding when to travel this road is key. We specifically decided to visit in low season (February) instead of the summer months, as the summer brings endless amounts of tour buses and crowds. It seems to be a particularly popular route with the Japanese who arrive in their thousands during high season (note the Japanese road signs and abundance of Chinese/Japanese restaurants in sleepy Bavarian towns!) So, although we knew that certain attractions and hotels/restaurants were likely to be closed, we decided that we’d rather have the streets of Bavaria relatively tourist free and put up with a smaller selection of food! Below is the itinerary we followed. We found it really easy to drive as there isn’t huge distances between the towns (at most an hour). The northern part of the route is also mainly on Germany’s famous autobahns, so you really do breeze around! Our first stop was Rothenburg ob der Tauber; a town from the Middle Ages, famous for its Schneeballen! 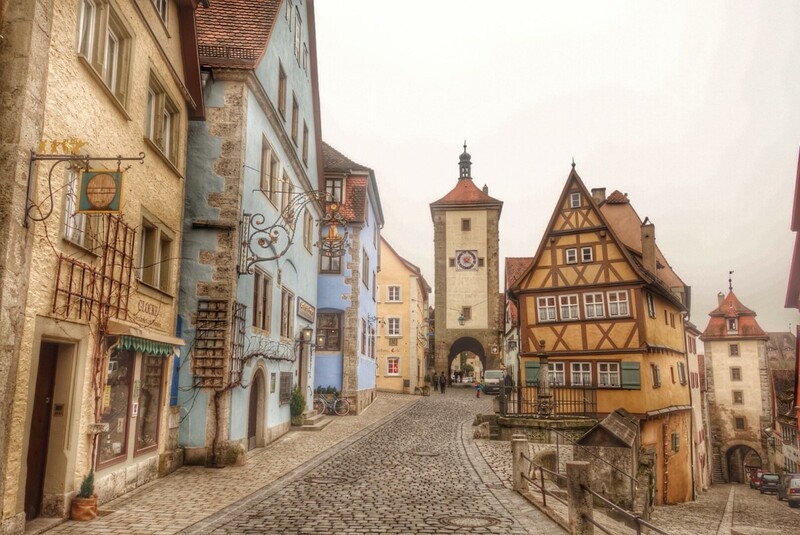 If you google ‘romantic road’ photos, Rothenburg will be at the top of the list, thanks to its picture-perfect buildings and cobbled streets. The first thing we noted on arriving here was how (slightly eerily) quiet the place was. It was almost like we were visiting an abandoned medieval theme park. After eventually finding an open restaurant, we found out that this town does simply shut up shop out of tourist season. We have no idea where its citizens go the rest of the year, or what they do, but we must have seen only a handful of people the afternoon we were there! It didn’t, however, at all spoil our visit and it was great being able to take so many pictures of this beautiful little place without fighting for a space on the pavement! A fun place to visit whilst you’re here is the Christmas shop, Käthe Wohlfahrt Weihnachtsdorf, which is open all year round. Bursting with decorations, festive displays and loud Christmas music, it leaves you feeling warm and happy (like Christmas, really!) There are also a number of interesting historic sites to see in this town too, including Jakobskirche and Mittelalterliches Kriminalmuseum: a museum that showcases gruesome weapons for punishment and torture during medieval times. Unfortunately, for us, it was all closed! After our slightly surreal walk around Rothenburg and having eaten our schneballens (you won’t struggle to find these here), we headed off to Dinklesbühl, in an increasingly desperate hope to see other human beings. This is another picture-perfect town on the romantic road and much to our relief, seemed to have real life people living in it! By the time we arrived late afternoon, and after getting up at 3am, we must admit we promptly fell asleep until dinner time! Walking around in the evening, however, we could appreciate the more authentic medieval quality of this town over Rothenburg (the only town to survive bombings during WW11). The paranoia that perhaps we were in some kind of German version of the Truman Show only hit again at dinner, when we were the only people in an almost too perfect restaurant. Again, although generally busy, this will be another town that comes alive during the warmer months. Accommodation: Hotel Deutsches Haus – this is a highly recommended hotel. Cosy, big spacious rooms and a delicious breakfast! We woke up early to a very snowy start in Dinkelsbühl and after loading ourselves up on as much eggs,hams and cheeses as we could cram into our bellies, we headed off on a wintry walk around the town. The town, with its cobbled streets and brightly coloured timbered houses, is pretty magical, especially when you take a walk around the lake. Looking out over the frozen, frosty water at the muli-coloured houses, felt like we could have been in a little fairytale town. Our first stop of the day after leaving Dinkelsbühl was Nördlingen. A great way to see this town, which we did, is to walk the towns 14th century walls, which form a perfect circle having followed the line of crater in which the town sits, created by a meteorite over 15 million years ago! Walking along the walls on a snowy but sunny morning was a great way to look out over the smoking chimneys of the quaint houses. 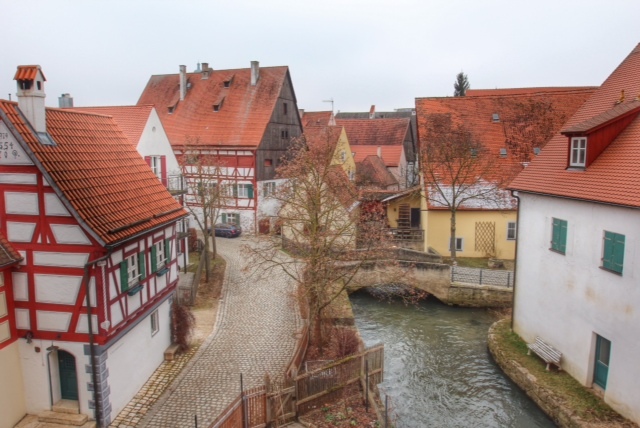 Now, if we thought Rothenburg was eerily quiet, it had nothing on Harburg. 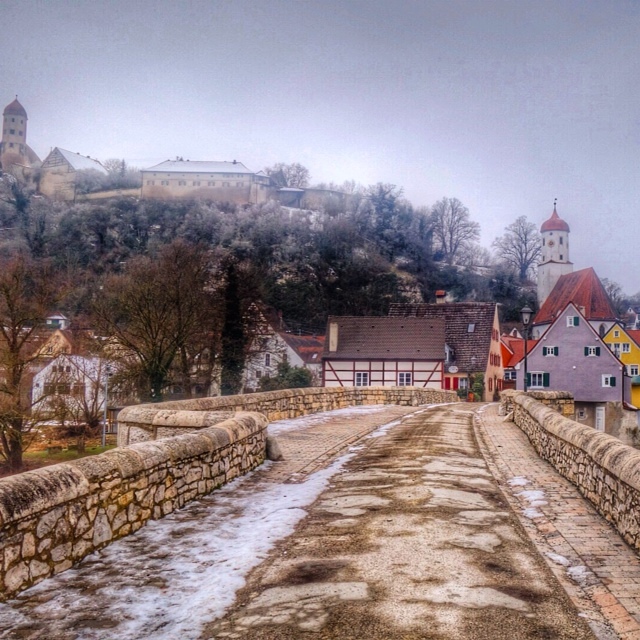 We decided to visit this sleepy place because of Schloss Harburg, a castle that sits overlooking the town. Unsurprisingly, the castle was closed, as appeared to be the town itself. Again, the town had shops, cafes, hotels….but none of which seemed occupied, by anyone. We saw one man, who stood staring at the same spot of pavement for a good twenty minutes, but other than that we saw not a soul. We decided to venture up to the castle anyway to see the views. It is a beautiful, almost toy like castle, worth a trip when it’s open. Unfortunately, as it was closed, the pavements weren’t cleared, resulting in a spectacular bottom bruising fall from me (Claire!) We suspect, again, this little town is full of life in the summer:there were signs for beer gardens over the river, so well worth a visit perhaps in warmer weather! Getting increasingly anxious to make human contact again, we set off for Augsburg and arrived late afternoon. Augsburg is the largest city on the Romantic road (hello people, real life, people laughing and talking!) and headed straight to an intriguing part of town called Fuggerei. 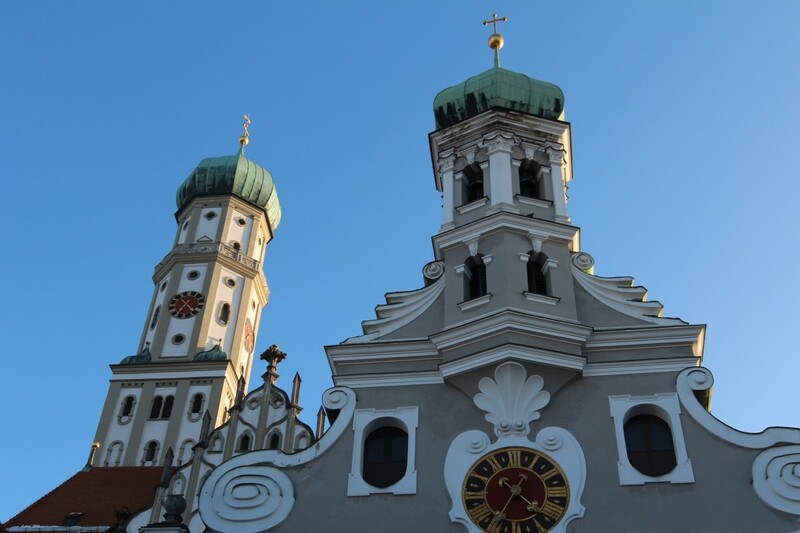 This is Augsburg’s Catholic welfare settlement and the oldest in existence. Fuggerei was founded by Jakob Fugger in 1516 where the needy citizens of Augsburg could live. Today, quite crazily, the rent remains at 1 Rhenish guilder (approximately €0.88) per year! Citizens are expected to pray three times daily. Today, there’s around 200 citizens living here, mostly the elderly although there are some students and young families. The houses are beautifully neat and tidy, and you can visit both a modern apartment and a “traditional” apartment to see how residents of Fuggereri originally lived. Large parts of the Fuggerei were bombed during WW11, and you can still visit the underground bunker used by the residents during this time. After another early start and another hearty breakfast, we headed out of Augsburg to the more snowier parts of Bavaria. We should note here that the drive from Augsburg down to Füssen is beautiful. As you travel further south towards the Bavarian alps, the roads become smaller and slower as they wind through sleepy (and in our case very snowy) villages, with the Alps steadily rising up in front of you. The drive probably took us longer than it should have, simply because we couldn’t stop getting out the car to take photos! 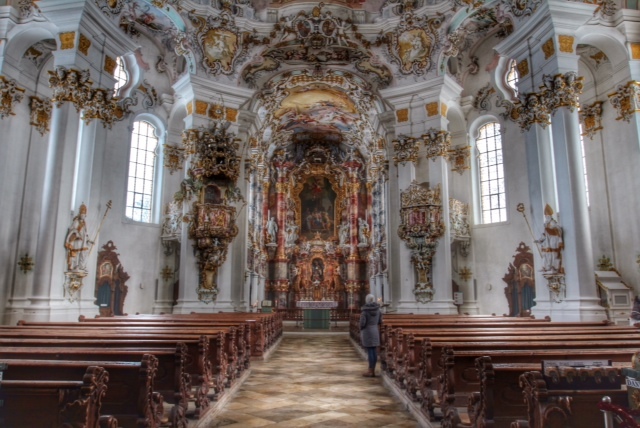 On our journey down to Füssen we made a stop at a tiny village called Wies, which houses a very special church. Wieskirche (White Church) is a Unesco-listed heritage site and one of Bavaria’s most admired baroque churches. Quite amazingly, for such a small town, around a million visitors a year visit Wieskirche! This church was commissioned to house the statue of Christ belonging to a farmer in the area who saw the statue shedding tears. It is a particularly magnificent church, especially the ceiling. An unmissable stop on this drive! This town is just heaven. Complete and utter heaven. Just a few minutes drive from the Austrian borders, Füssen sits nestled between the Bavarian Alps and has a cosy and welcoming feel. 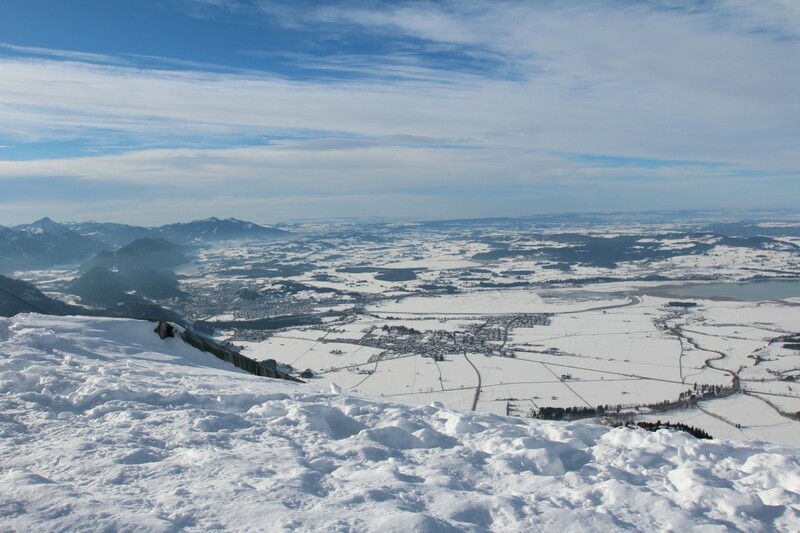 We arrived on a particularly sunny day, think blue skies against pure white snow and breathtaking mountains *sigh*. After dumping our bags at our hotel and a quick lunch, we headed straight to the Teglebergbahn to take in views on top of the mountains! If you’re on the claustrophobic side and don’t like heights (like me) then going up in the tegleberg (cable car), crammed with skiers isn’t the nicest experience. If you can survive the five minute journey up however, the view from the top is simply breathtaking. After taking in the panoramic views over the Alps, we joined a German brass band (yep, that’s right) at the bar at the top and relaxed in some deck chairs with a delicious Bavarian beer for the afternoon. It was a perfect afternoon! Accommodation: Hotel Cortiina: highly recommended! We didn’t have much time to explore Munich but surprisingly managed to cram a lot in before our flight home. Here’s our top sites to see when you only have 24 hours! Our journey through Bavaria can be summed up by the following words: breathtaking, magical and LOTS of curried sausages! 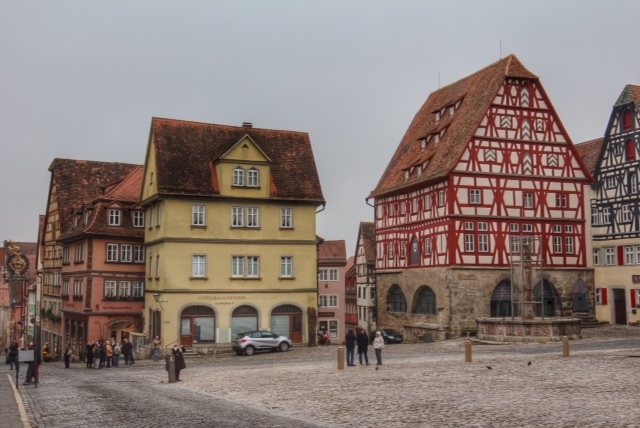 "Summer in Europe: our two week itinerary"
I visited Rothenburg briefly on a school trip along with my exchange partner during my first visit to Germany, when I was 15. I barely spoke any German at the time and had no idea what was going on, and got the same impression as you, that it was a weirdly deserted theme park. I was really surprised to find out years later that it’s a real town! My Girlfriend is from Germany and every time we go its more gorgeous than the last. Your photos do it justice though! You should stay in Frankfurt for a night, its a really great big city!